Simone Beaubien on her home stage at the Cantab Lounge. Photo by Rich Beaubien. 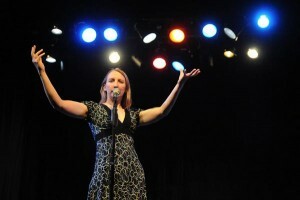 Simone Beaubien has operated as primary curator for the Boston Poetry Slam @ the Cantab Lounge since February 4, 2004. Only the second SlamMaster in the history of the show, she acts as host, arithmetic whiz, press agent, and webmaster, as well as performance and strategy coach for the annually selected slam team. She currently curates the slam series at the venue and shares booking responsibilities for the feature series with Cassandra de Alba. Simone first walked into the Cantab in the fall of 1999 upon the repeated urgings of then-regular Jack McCarthy. She judged the team selection slams for the Finals-bound 2000 Cantab Slam Team and subsequently was the top scorer in the venue’s 2001 team slams, her first team of eight (2004 through 2008, 2010, and 2016). 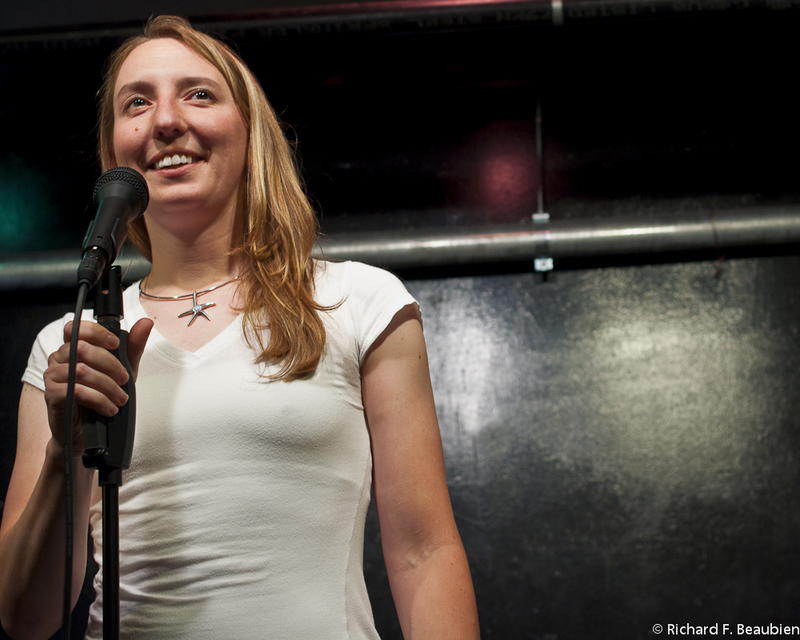 Simone went on to serve as the Host City Director for the 2011 and 2013 National Poetry Slams in Boston, hailed at that time as the best-attended (6000+ spectators) of all time. She currently provides coaching servies for the venue’s slam team and also serves as the Tournament Director for the annual NorthBEAST Regional Poetry Slam. Simone Beaubien hosting the 2008 NorthBEAST Regional Poetry Slam. Photo by Marshall Goff. As a member of the Boston Poetry Slam Team, Simone competed in the Finals of the 2008 National Poetry Slam in Madison, Wis. In 2007, she hosted the Finals of the Individual World Poetry Slam in Vancouver, B.C., and in 2010 hosted the College Unions Poetry Slam Invitational Finals at Emerson College’s Majestic Theater in Boston. She has been invited to perform on stages from Seattle to Columbus to Chicago to New York City, and her poem One-Watt Lover was performed by John Malkovich as part of Jacob Marshak’s chamber ensemble Unsent Domestic Letters. You can find her work on the Cantab stage every Wednesday night; to book her for a show, visit crushingabird.com.